Tired of constantly switching of weapon and tool? AutoSwitch 1.7.2 and 1.7.10 is your solution, as it automatically takes care of selecting the right tool for the type of block you try to break. For example if you are in the mine with rock, and gravel suddenly appears, your tool change one pickaxe to shovel, automatically, without having to do nothing. The same goes for the sword, when an enemy appears you have to take your sword quickly, however with this mod installed, the sword appears in your hand at the first hit you give. Of course, be sure you have both weapons and tools in the character’s inventory for properly working. 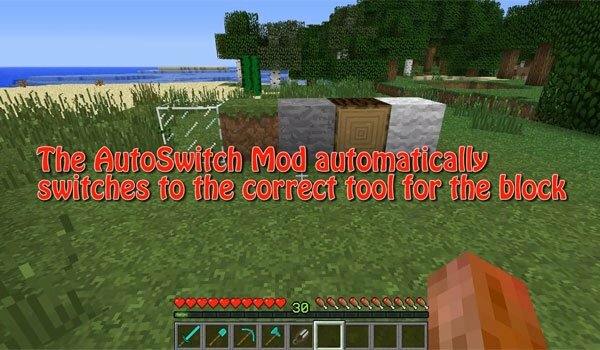 How to install AutoSwitch Mod for Minecraft 1.7.2 and 1.7.10? Paste the file downloaded “ThebombzenAPI” inside .minecraft / mods folder. Stop looking for the tools that appearing alone in your hand!